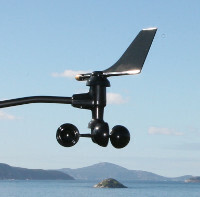 We use the Hydreon RG-11 Optical rain sensor configured in tipping bucket mode to detect rain. Every time a predetermined amount of rain hits the sensor it will switch a relay. 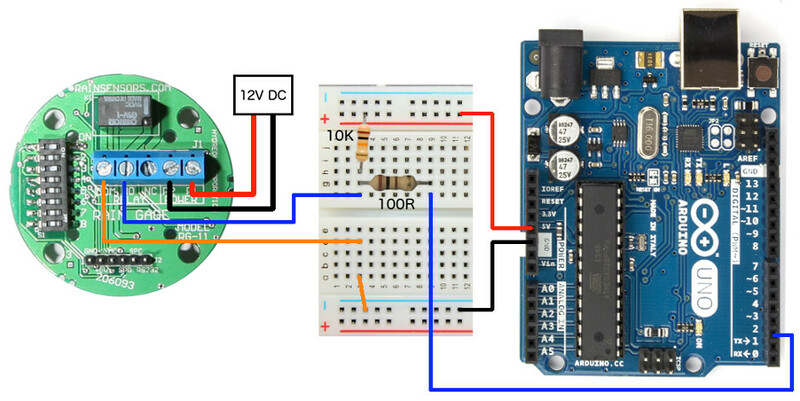 This switch is detected by the Arduino and can be used to count the amount of rain that has fallen. Note: Images shown on this page are not to scale. Sample Sketch (Download - Sketch File) Demonstrates Hydreon RG-11 connected to the Arduino. 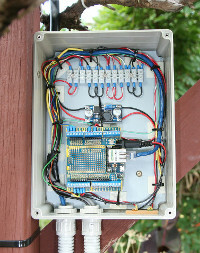 The rain sensor appears to the Arduino as a switch and is wired up the same as wiring up a switch to the Arduino. The RG-11 has either a NO (Normally Open) or NC (Normally Closed) output. We have connected to the RG-11 using the NO (Normally Open) outputs. When there is no rain detected the digital input on the micro controller (Arduino) will be pulled to 5V via the 10K resistor. 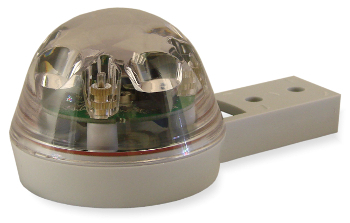 If rain is detected then the RG-ll NO output will be closed and the digital input will go to ground. The 100 ohm (100R) resistor is used to protect the micro controller input from damage if it is mis-configured and a dead short is created. This will limit the current flow and hopefully prevent any damage to the input. The hookup and Arduino Sketch is for connecting a Hydreon RG-11 to digital pin 2. 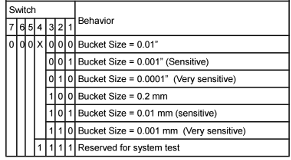 We have configured the RG-11 for tipping bucket mode which means that it sends a pulse when a preset amount of rain hits the sensor. The dip switch mounted on the circuit board is used to set the mode of operation for the RG-11. The sketch uses an interrupt handler to detect when a pulse is sent. When the input it is triggered it will execute the interrupt handler routine called rgisr on line 43. This routine increments the tipcount variable by 1. It is important that we keep the amount of code in the interrupt service routine as small as possible.